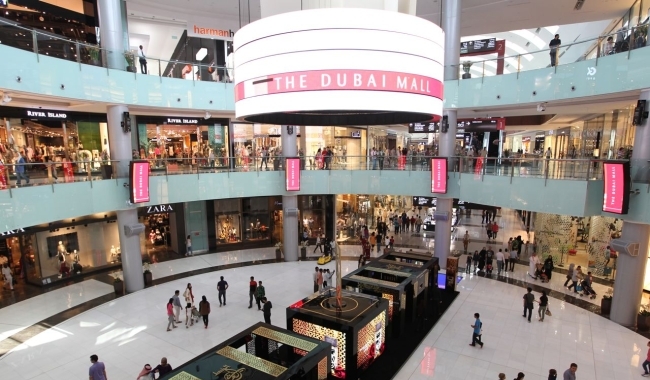 The Dubai Mall, with its 1,200 retail outlets, two anchor department stores, and over 160 food and beverage outlets is one of the the world�s largest shopping and entertainment destinations. It is part of the Burj Khalifa complex and attracts more than 750,000 visitors every week. Attractions within the shopping mall include the famous Dubai Aquarium and Under Water Zoo, with the world's largest viewing panel, Dubai Ice Rink, Gold Souk, Fashion Catwalk atrium, Oasis Fountain Waterfall, SEGA Republic indoor park, 250-room luxury hotel, 22 cinema screens etc.